Written and illustrated by Britisher ‘BB’ (‘BB’ being the nom de plume of Denys Watkins-Pitchford), this is one of only three BB books still in print*. The other two, “The Little Grey Men” and “Down the Bright Stream” are excellent, and I’ve written very short reviews of those over on Goodreads. As for Mr. Bill Badger and his Wandering Wind, well, it is a rather short read. The book is printed with a larger-than-normal font, and there are fewer words on each page than in the other aforementioned BB books, and, yet, it is still only 120 pages. Furthermore, many of those pages are only half text (at chapter beginnings/endings), and many pages have large illustrations that take up sizeable portions of print space! So, really, it’s only about 100 actual pages. The point is, if you want something to knock out in an hour or two, this is it. 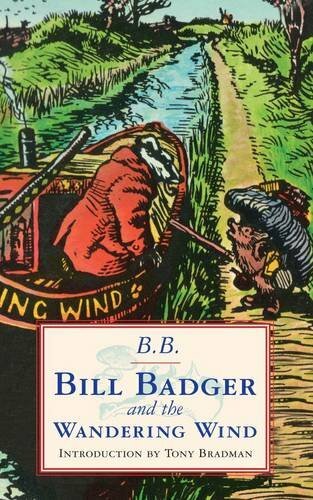 The book tells an adventure story in which Bill Badger gets in a boat, goes down a river, and faces many problems along the way. Beyond the effective characters and colorful words, I cherish the sense of morality in the story. I love that Mr. Badger has a very generous spirit. For example, despite being in nearly complete poverty, he decides to give his very last coin to a blind begger mouse. This is highly reminiscent of the widow woman in Mark 12:41-44. 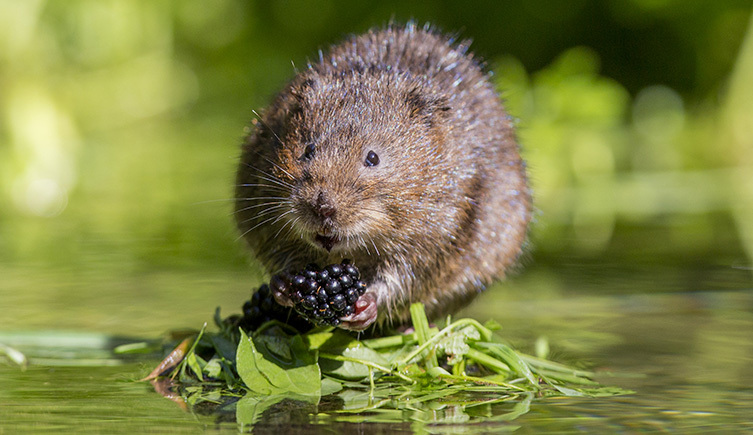 This water vole is enjoying a blackberry. He is probably really good at building boats, too. Anyway, the two characters have genuine esteem for each other despite being from very different stations in life (as mentioned, Bill is very poor; McVole, however, is quite prosperous). The great thing is that neither one sees the other as someone to be resented; rather, they are courteous and of good cheer with one another. That is quite refreshing, and I appreciate it. Before I close, one more thing deserves mention: BB is excellent when it comes to writing about nature. He is especially gifted in writing about streams, rivers, and the adjoining foliage (he’s even written several books explicitly dealing with the outdoors). If you enjoy reading stories set in well-narrated natural settings, I recommend this book. In the end, despite being a children’s book, I find Bill Badger and the Wandering Wind to be very enjoyable. I commend it to anyone looking for a quick read, fun vocabulary, good morals, and a well-described natural setting. * So, this book was in print recently, but upon further review it looks like it recently went back out of print. Lame. Great review, Grant! Now I want to read this cute book. What book are you currently reading? Would like to participate in the read-a-long concept you had in 2014.